Find out essential capabilities needed for maintaining secure operations across multiple branches and remote locations. It is forecasted that 25% of enterprises will be using SD-WAN technology by the end of 2019. 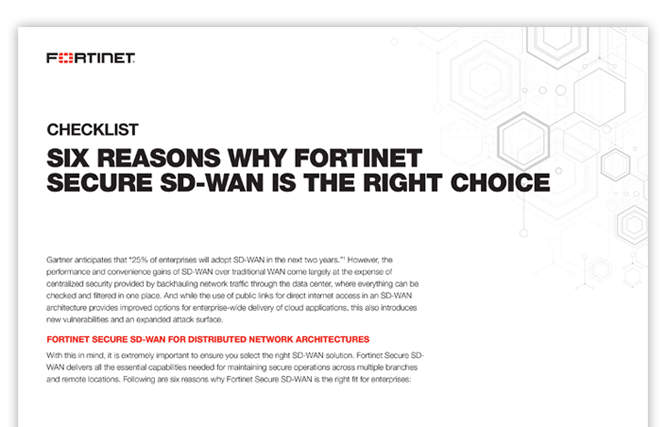 Download our checklist to learn about six security capabilities that you should demand from your SD-WAN deployment and how Fortinet Secure SD-WAN offers the best of networking and security capabilities in one solution.